Wings! I believe you could fly?? 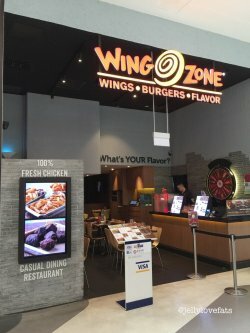 Originated from USA, Wingzone was started by 2 men, Matt Friedman and Adam Scott. 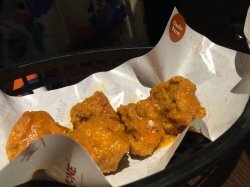 They came by developing this recipe of buffalo wings in year 1991, all because of Florida university students. At that time, pizza delivery was the only food for students studying late, which gave Matt and Adam an opportunity to provide an alternate choice to these students' boring pizza life. 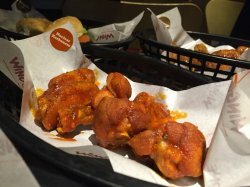 These buffalo wings recipes successfully conquered the hearts of USA and by year 2009, Wingzone went on their way to Global expansion. 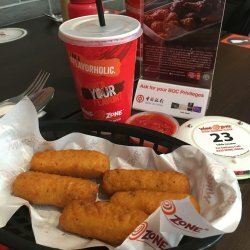 Currently in Singapore, there's two Wingzone outlet. One situated in Bugis Plus shopping mall and the other newly set up store at Buangkok. I chanced upon Bugis outlet while shopping with my friends and we decided to give it a shot. Wingzone menu was quite extensive, from their signature buffalo wings to drumsticks, hand-breaded tenders, burgers, salads, sides and desserts. As for choice of flavours for the meat, there were 15. We chose cool ranch, honey, buffalo bliss, garlic parm and thai chili. 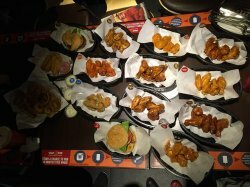 We ordered the buffalo wings set meals instead of ala carte, which came with side wedges fries and a drink at $10.95 per set. 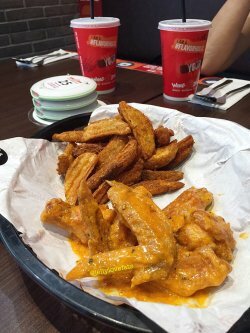 There's also option to top up additional $0.50 for Wingzone signature dips and dry rubs for the wedges. We added blue cheese dip and blackened voodoo rub. 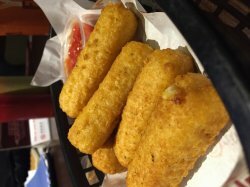 Lastly, cheese lovers like us couldn't leave the counter without ordering mozzarella sticks! - Naked wings tossed with spices and herbs. Crispy skin but was a little salty. Most votes went to this flavour. - This flavour brought out a smokey taste unlike what the name describes. It wasn't sweet like honey but more on the bbq side. - These 3rd flavour we tried was sourish. The tangy aftertaste resembles tabasco. Not a crowd pleaser..
- This flavour ranked my 2nd choice apart from the cool ranch wings. They tasted very garlicky, although slight salty but I still love them! - There wasn't any wow factor for this flavour. Too sweet, simply the common Thai chilli that we could get bottles from supermarts. 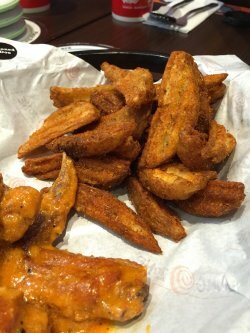 - We had both the original wedges fries and also the blackened voodoo seasonings. Original ones were still the best! Voodoo tasted weird with spices that my tongue couldn't accept. Hahaha.. I guessed that's the reason behind how it was named! 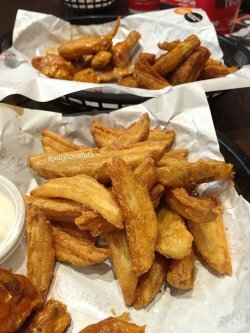 Not forgetting to mention these wedges fries comes in crinkled shapes. I do agree with my fellow foodies that these shapes did improve the biting texture of fries in our mouth. 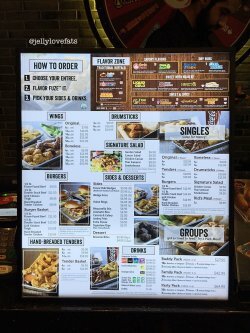 Went to eat with my friends at Bugis+, never seen so many flavours on a single menu before, I actually had to spend some time to think about it. Fortunately, the staff were kind enough to allow me some time to think of what to choose. Sweet Samurai glazed the chicken with Asian flavours of Teriyaki, soy, ginger and honey, Sweet Samurai perfectly represents the fusion of the Asian flavours into Western food. 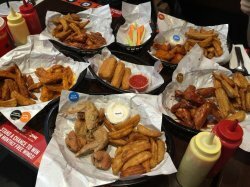 Offering a wide variety of flavours for your chicken, Wing Zone lures you to a second visit to their seemingly never ending types of exotic flavours that you can experiment! 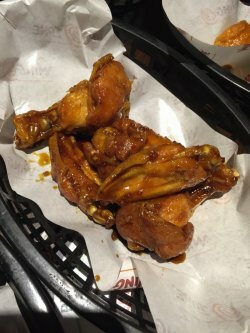 Located on the 4th floor of Bugis plus is Wing Zone. 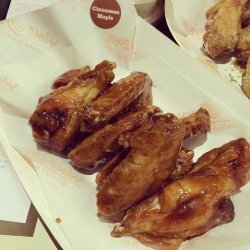 Having studied in the US, I do miss wing nights and grabbing a whole bucket of wings for cheap and washed down with a cold root beer. 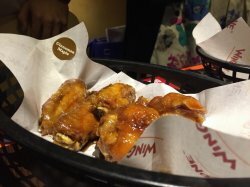 But being in Singapore, these wings don't come cheap and no one seems to sell them in buckets (50 wings) Wing Zone is touted to have had 20 years of experimental success with their 13 flavours, originating from Florida. Looking at the menu, it really reminded me of being back at my second home. The usual items like mozarella sticks, burgers, wedges, winglets and drumlets etc. Most of it, seemed pretty affordable and they are all nett priced. 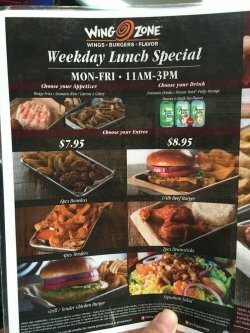 This was their weekday lunch menu from 11am-3pm. I visited on a tuesday afternoon at 12pm and my colleague and I were the only customers the entire time. After you have picked your order, regardless if it's a burger or not, you have to pick a flavour. 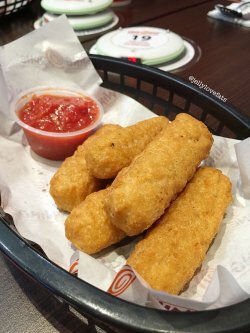 You get 5 mozarella sticks for $6.95. First off, the exterior of the mozarella stick wasn't breaded, but rather just covered in flour. It was piping hot when served with the super chilled and cold salsa. This was completely unexpected but oh well! 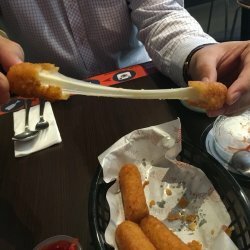 The mozarella stick did have a long stringy cheese in the center which wasn't impressive in taste or texture. It felt very chewy and hard. The batter that covered the mozarella stick was too thick and intense for me. I got pretty full from slowly eating one mozarella stick. Served with a side of full-flavored version of traditional honey mustard offers blissful relief from the heat aka Liquid Gold. The chicken tenders were dry and hard. The were hot but I can pressume the meat was just as frozen as the mozarella sticks were frozen a long time ago. Not a single chicken tender tasted tender. It was another disappointment. The sauce however was it's saving grace. The burger though small in size, was the best tasting item we had ordered. The meat was seasoned with Honey Q that had Sweet honey and smoky BBQ to deliver great Southern flavour. The meat itself wasn't as dry as the chicken tenders or mozarella sticks. The bread felt a bit hard and stale though. 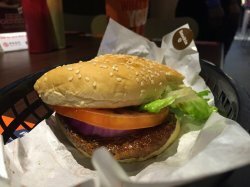 The tomatoes and veggies used in the burger tasted fresh. The wedges were slightly too salty for my taste but they were fresh and crisp on every bite. I got a side of 6 pc wings with Tokyo Dragon which had hot honey meets classic teriyaki for an experience of ginger, soy and heat. The wings were dry but the skin of the chicken was slightly crispy. The sauce gave a sharp sweet and sour sensation. The sauce was evenly distributed amongst the 6 pieces of chicken. 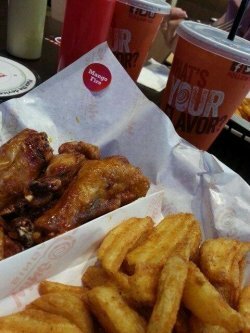 Overall : The food came quickly, maybe because we were the only customers during a weekday lunch time, but the food didn't satisfy any of my cravings for wings. The staff were polite and very friendly. They were also very patient and helpful when it came to picking a sauce for the wings. It starts in 1991 on the campus of the University of Florida as late nite supper for students. People like the flavours created and keep coming back. Today there the restaurants can be found over 4 continents. Besides expanding to Singapore, it has also expanded to Ipoh, Malaysia. 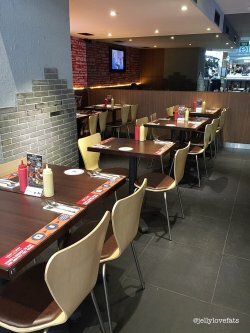 The solo outlet in Singapore is located just next to the escalator at level 4 of Bugis+. It looks like a fast food restaurant at first glance. But it is actually a causal restaurant as food is cooked upon order. So the food may take awhile to be ready, but you will be well rewarded for your effort. Unlike the usual fast food restaurants, only fresh chickens are used here. We start the meal with a tasting of 10 different flavours. Out of these 10 flavours, Smokin'Q, Tokyo Dragon and Honey Q are difficult as all 3 have similar BBQ taste but vary in different spicy levels. Thai Chilli is the easiest to recognize. Our meal of the night! We start with the wings which are priced from $7.95/ 6 pieces for original and $6.95/ 6 pieces for boneless. Although it seems a quite normal flavour, it has a balance between the spicy and sweet. It has a slightly sweet BBQ taste. It starts with a sweet fruity mango taste, but ends with an explosive spicy taste. To prevent the spicy taste from coming, try to eat as much as possible. The flavour itself kind of reminds of Hosin sauce. It has bites of ginger in it. 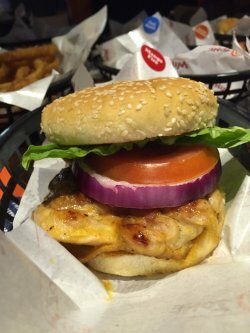 The grilled chicken patty is flavour fuzed with mango fire. 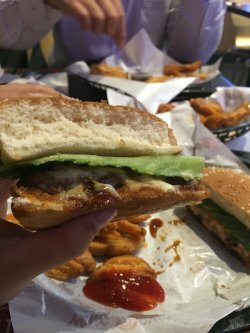 With the bun, it is not as spicy as the wings alone. The chicken patty is quite moist and tender. 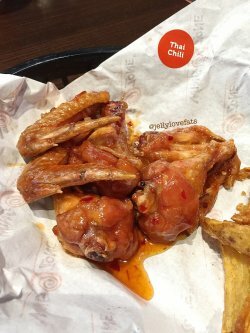 Spicy and peppery BBQ flavour fuzed wings. The flavour isn't what I'm expecting. I'm thinking that it would be a dry rub on the meat or a cream colored sauce. I'm surprise that it turns out to be a orange colored sauce. I could taste the hints of minced garlic and bites of Parmesan cheese in the flavour sauce. This sweet black colored flavour kinds of reminds me of the sweet flour sauce which is regularly used in the spring roll. It is sweet and additive at the same time. This is one of the 2 dry rub flavours available. It kinds of reminds me of the Taiwanese salt and pepper chicken cutlet. Kinda of salty. Although this flavour has the highest heat index (4 chillis), it's taste isn't that frightening. It starts with a rather strong Tabasco taste and ends with a spicy taste. It is chicken coated with maple syrup. Too bad there is no waffle to go along with. So yummy. 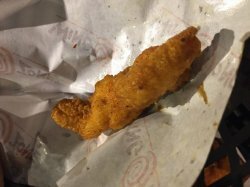 Even without any flavour on, the chicken tender is tender and well seasoned. None of the stiffness which usually found in frozen chicken. Remember to eat this while it is still hot. You will be surprised how long the cheese can last. 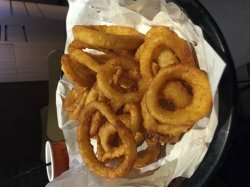 The onion rings are huge and light in taste. Best of all it not coated with thick batter. 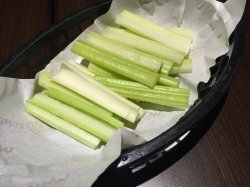 If you feel that it is too spicy, do try to take off the heat with celery dipped in Bleu Cheese or Ranch sauces. Overall the chicken really tastes very delicious. Can't wait to come again to try the rest of the flavours. Currently there are 16 flavours available : Buffalo Bliss, HotShot, Nuclear Habanero, Garlic Parm, Lemon Zinger, Liquid Gold, Sweet Samurai, Honey Q, Cinnamon Maple, Thai Chilli, Smokin'Q, Tokyo Dragon, Mango Fire, Blackened Voodoo, Cool Ranch and BBQ Nirvana, with more to come. 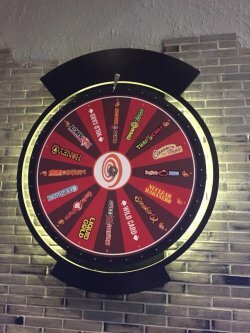 If you could not decide on what flavour to have, why not spin the wheel which is located behind the counter. If it is Nuclear Harbanero and you are willing to take up the challenge, you could be getting 10% discount on your order. 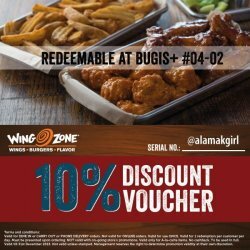 If you are planning to dine in, takeaway or phone delivery at the restaurant, do not forget to show the above picture or code @alamakgirl, which will entitle you to 10% discount on your order. I was dining at Wing Zone with my friend earlier on. 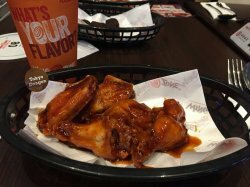 I purchased the 6 piece wings meal in Mango Fire flavor while my friend bought 6 piece wings meal in Honey Q flavor. Both of our food were served hot with a good portion to make us full. The Mango Fire flavor was really unique with a refreshing fruity spiciness to it. Mango and Chicken sounds weird together but surprisingly, it taste really good together. A MUST TRY for spicy lovers! 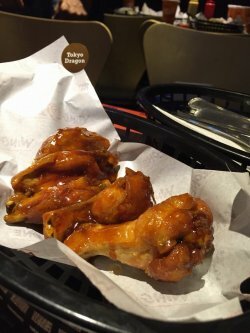 As for Honey Q wings, it has a strong BBQ taste with a little sweet taste. Tasted more like BBQ sauce. Not bad! The wedges were serve with a good portion with a really crunchy outer layer. Both of us love the mango fire wings and wedges! The environment was really nice too! 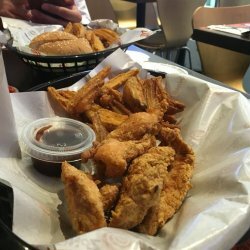 Unlike other environment that sells similar food, Wing Zone provides a really clean and comfortable environment to dine in. The most important thing is that it does not blast fast music that makes individuals feel that there is a need to eat as fast as possible. Total plus point! Overall, it was a great dining experience and I will be coming back for more WINGS and FLAVORS! 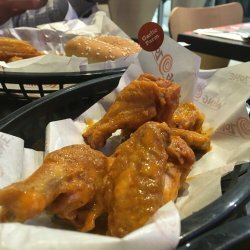 I have visited Wing Zone for a few times and it's time for me to write a review for Wing Zone. 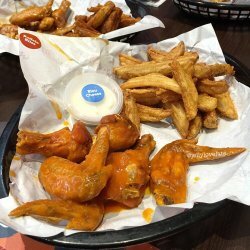 Wing Zone always provide a refreshing dining experience for me with its array of flavors. Yesterday, I tried 3 piece drumsticks meal in Sweet Samurai Sauce and it was awesome! 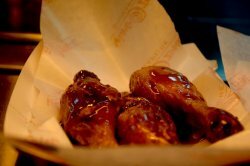 With a strong teriyaki base and a mild honey taste, the Sweet Samurai Sauce matches perfectly with the drumsticks. All drumsticks were fully covered with the sauce with additional sauce for you to dip the tender drumsticks into. The wedges has always been one of my favourite. With a cripsy outer layer and a soft sweet potato filling, it just taste really good! 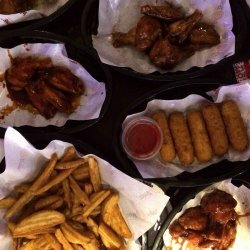 Overall Wing Zone is an excellent restaurants for individuals who are interested in trying something new. For those who are looking for something more catered to the local taste yet different, Sweet Samurai and Thai Chilli will be the flavors to try. For others who are looking for something daring and unique, Mango Fire flavor is a must to try! Personally, my favourite flavors are Sweet Samurai and Thai Chilli! It was a good meal and I enjoyed myself! 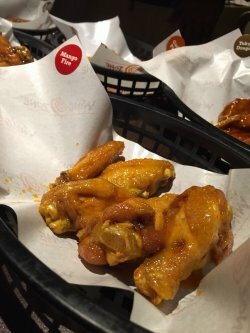 It was my first visit to Wing Zone with my friend. Both of us ordered 6 piece original wings meal in 2 different flavors, namely Mango fire and Smoking Q. 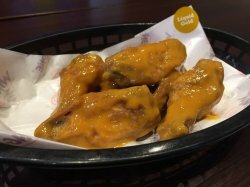 Despite stating that the Smoking Q was a spicy flavor on Wing Zone's menu, Smoking Q was actually a mild spicy flavor and has a strong BBQ taste. This sauce goes really well with the wings. 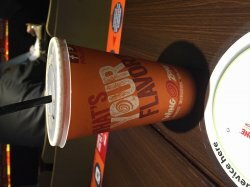 As for Mango Fire flavor, it was really spicy and has a unique spiciness that is suitable for individuals who are interest in trying something new. Wedges were crunchy. The food was served hot with a good portion. As for the customer service, service staff at the cashier could have been faster. However, this may be due to customers infront of us were asking for recommendations too. Great lightings and up-to-date music, providing a good environment for catch-up among small group of friends. 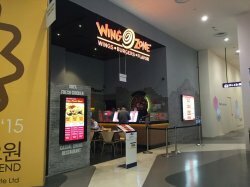 Just visited Wing Zone Bugis+ branch for a lunch. I have ordered 6 piece Cinnanmon Maple flavored wings and mozzarella stix. My food was served hot and the wings were tender. 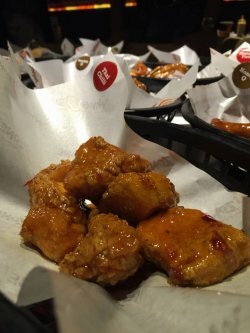 The Cinnanmon Maple sauce was given generously and every wings were completely covered with the sauce. The sauce was actually maple sauce and it was sweet but the sauce and wings matches really well so tumbsup for thisi dish! As for the Mozzarella Stix, it was not bad with alot of cheese served in every stick. However, being a cheese lover, the cheese taste was not as strong as what I desire to have. The dining environment was good as there are shows screened in the restaurant for customers to watch while waiting for our food. Ordered 18 pieces of original wings in 3 different flavors, mozzarella stix and large wedge fries. Cinnamon Maple flavor was really sweet. On the ther hand, Honey Q flavor was not really sweet with a stronger taste of BBQ sauce. Sweet Samurai flavor was very good too with a strong teriyaki taste. Out of these three flavors, Sweet Samurai was my favourite flavor. Mozzarella Stix was very cheesy. A must to try by all the cheese lovers out there! With a crispy outer layer and hot, chewy cheesy mozzarella cheese interior along with a tomato based sauce for diners to dip into, its the perfect combination that all visitors must try! love it! Wedge fries were good too as I personally prefer thin crispy wedges. Staff at the cashier was really nice too as knowing that all three of us do not like spicy food, he recommended us to try these 3 flavors. Besides his patience in recommending and waiting for us to decide, presence of nice music and dim environment provides a more relaxing environment for customers to chill with their friends. Overall, good experience! Will be coming back with my friends for more delicious wings! 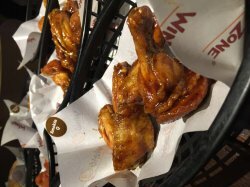 Bought the 6 piece original wings in Liquid Gold flavor ala carte while my friend bought 6 piece original wings in Mango Fire flavor ala carte. Love my Liquid Gold wings! The wings are all totally covered with the honey mustard sauce. Wings were slightly small. However, the wings were soft and tasted really good with the Liquid Gold flavor. Highly recommend this dish to anyone who loves sweet food. On the other hand, the Mango Fire flavor was too spicy for my liking. However, my friend love it as she says there is a unique spiciness to this flavor. So, I guess its really important to choose the correct flavor. 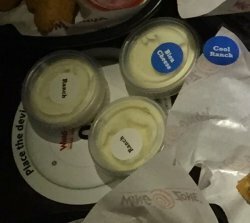 Thanks to the counter staff whom patiently introduce different flavor based on our preference, both of us were lucky to buy a flavor that we love! As the wings were not enough to fill up our stomach, we ordered extra sides, large onion rings! The onion rings were served hot and crispy, love them! As the food were said to be cooked on the spot, we waited for quite long for our food to arrive. However, staff were really patient and friendly as they would always duly serve the food once its ready. 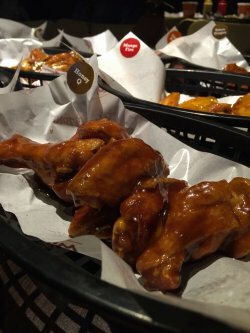 Besides the quick service, the presence of free Wifi and screening of 9GAG allow us to have a more enjoyable time waiting for our delicious wings! Overall, good experience! Great place to hang out during weekday night because the outlet has a chill environment for a good meal after a long day of work! 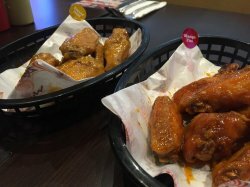 It was my first time visiting Wing Zone and I decided to dine in the restaurant because I had a strong craving for chicken wings. I decided to order the 6-piece value meal for lunch. 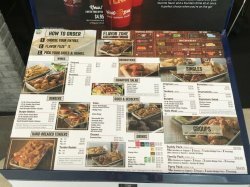 Wing Zone offers a huge variety of flavours so I asked the cashier staff to recommend some of the more popular flavours to me. I decided to go with Sweet Samurai for its teriyaki flavour. The waiting time was pretty quick and my food came quite promptly. I absolutely loved my choice! 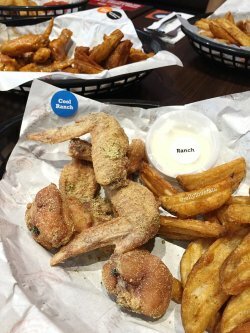 Being a chicken wing lover, I think that the wings served were really commendable because the skin was crispy and the flesh was juicy and succulent. 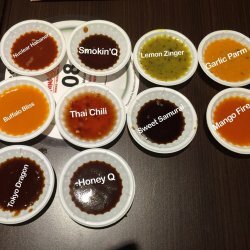 The sauce that I chose was sweet and tasty and I really enjoyed it very much. However, the serving size was pretty small and I didn't have enough of the wings. The wedge fries made up for it though. I felt a lot fuller by the time I finished my fries. 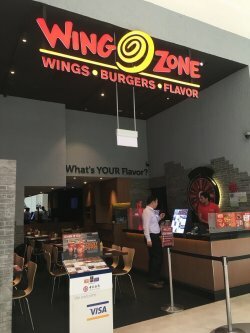 I must also commend the service staff in Wing Zone. I must say that they are all pretty well-trained. They were very knowledgeable about the different flavours offered in the restaurant and could answer all my questions when I prompted them at the counter. Furthermore, they were very approachable when serving the food to me and were quick to accede to my requests whenever I called for them. I would have prefered it if the restaurant was more brightly lit though. It was kind of weird that the speakers were playing pop music rather loudly, with the screening of "laughs for gags" but the choice of furniture and lighting seemed to create a more "cosy" environment. 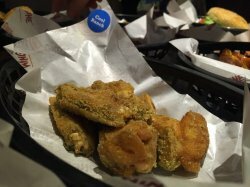 Nevertheless, it was a largely pleasant experience here at Wing Zone and I would definitely love to come back again. 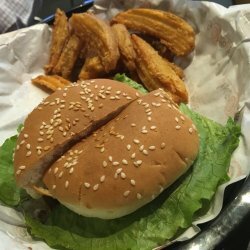 Visited Wing Zone for a few times and I would really recommend this restaurant to individuals who like to try something different. This is because of the wide variety of unique flavors that gives you a new experience each time you visit. This makes Wing Zone one of my favourite chicken wing restaurant. Good job and keep up with the good work! My favourite flavors are Liquid Gold, Thai Chilli, Sweet Samurai and Nuclear Habenaro. Liquid Gold and sweet samurai are more suitable for sweet tooth individuals as liquid gold flavor is actually honey mustard while sweet samurai has a teriyaki base. Thai chilli is more sweet than spicy while Nuclear Habenaro is really spicy and more towards a salty taste. Hence, it is important to choose the right flavors. 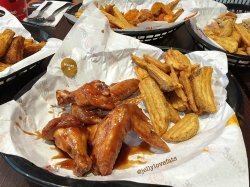 These flavors are best eaten with Wing Zone's original wings. Ordered grilled chicken burger value meal. The burger was really delicious and of a good portion. Grilled chicken was tender and juicy. Love the wedges because they are not the usual 'fat' wedges. Instead, they are smaller and more crispy with a sweet potato taste. My friend ordered 6 piece original wings. The chicken was slightly small but Tokyo dragon tasted good!It is a spicy flavor but not too spicy with a sweet taste. Suitable for individuals who love sweet spicy. All chicken was perfectly coated with the flavor, allowing us to have a good meal to indulge in this flavor. Good customer service as well because the staff were really friendly and patient in suggesting flavors for us to try. Overall good experience!